One of my Linear B students pointed to me, just today, that it is difficult to remember all of the Linear B Ideograms, which hardly comes as a surprise, given that there are so many of them (well over 100). Ideograms often occasion confusion. With that in mind, I devised the chart which you see above, as a guide to the simplification of learning Linear B ideograms in general. The situation is further bedeviled by the fact that there are also a few logograms in Linear B, which also have to be learned if the student is to be able to advance to the highest level of proficiency in deciphering and translating Linear B tablets. There is also at least one homophone, RAI, illustrated in the chart above, which very often means “saffron” in Linear B. Students of Linear B have to keep their eye out for the double function of the homophone RAI, which is either simply pronounced as such or is not a homophone at all, but the ideogram for “saffron”. It can be one or the other, but never both. 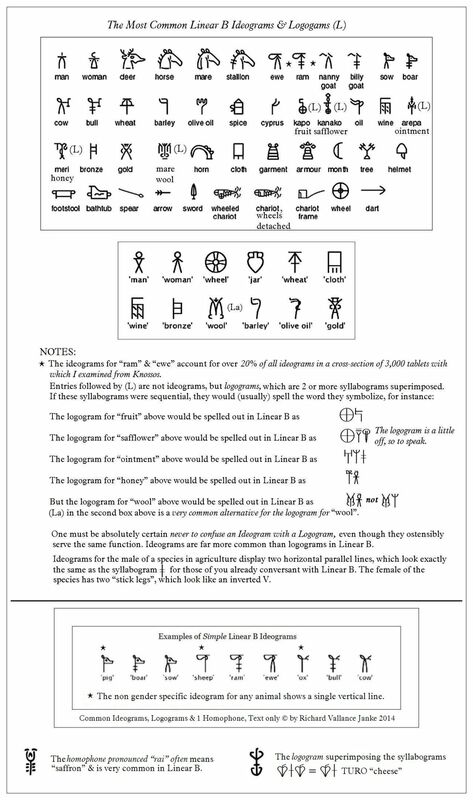 The chart above includes all of the most common ideograms and logograms in Linear B, so if the student masters all of these, that in and of itself should prove to be a more than sufficient foundation for the decipherment of the vast majority of ideograms in Linear B. I should note in passing that the ideograms for “sheep”, “rams” & “ewes” account for more than 20% of a cross-section of 3,000 Linear B tablets with ideograms from Knossos which I have closely studied over the past year. But this does not alter the fact that ideograms for other animals and livestock also often appear on Linear B tablets. So the student of Linear B must stay alert, and not confuse the ideograms for one species for those of another. I wish all of you who are students of Linear B the best of luck (although luck has nothing to do with it!) in learning this requisite set common ideograms and logograms. I note in passing that this is our 500th. post, coming a mere two months after our 400th. Posts on our blog are literally taking off!